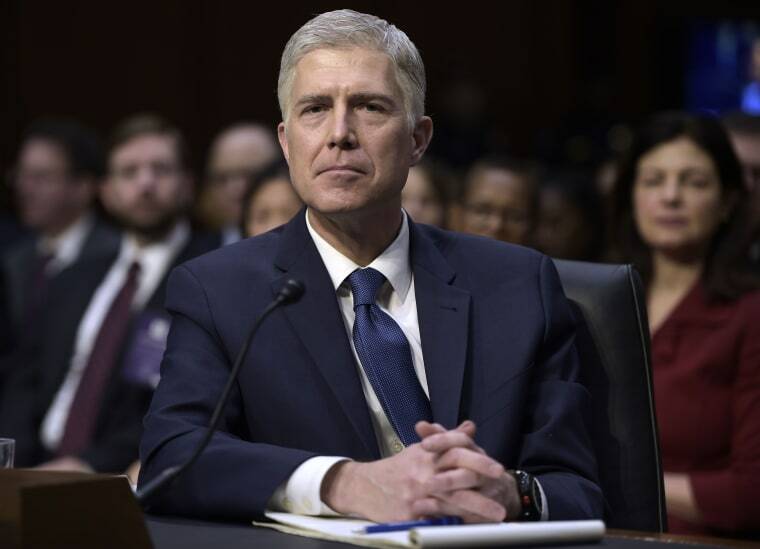 The text of Judge Neil Gorsuch's opening statement to the Senate Judiciary Committee as prepared for delivery. I could not even attempt this without Louise, my wife of more than 20 years. The sacrifices she has made and her giving heart leave me in awe. I love you so much. We started off in a place very different from this one: a small apartment and little to show for it. When Louise’s mother first came to visit, she was concerned by the conditions. As I headed out the door to work, I will never forget her whispering to her daughter - in a voice just loud enough for me to hear - Are you sure he's really a lawyer? To my teenage daughters watching out West. Bathing chickens for the county fair. Devising ways to keep our determined pet goat out of the garden. Building a semi-functional plyboard hovercraft for science fair. Driving 8 hours through a Wyoming snowstorm with high school debaters in the back arguing the whole way. These are a just a few of my favorite memories. I love you impossibly. To my extended family across Colorado. When we gather, it’s dozens of us. We hold different political and religious views, but we are united in love. Between the family pranks and the pack of children running rampant, whoever is hosting is usually left with at least one dry wall repair. To my parents and grandparents. They are no longer with us but there’s no question on whose shoulders I stand. My Mom was one of the first women graduates of the University of Colorado law school. As the first female assistant district attorney in Denver, she helped start a program to pursue deadbeat dads. And her idea of day care sometimes meant I got to spend the day wandering the halls or tagging behind police officers. She taught me that headlines are fleeting – courage lasts. My Dad taught me that success in life has little to do with success. Kindness, he showed me, is the great virtue. He showed me too that there are few places closer to God than walking in the wilderness or wading a trout stream. Even if it is an awfully long drive home with the family dog after he encounters a skunk. To my grandparents. As a boy, I could ride my bike to their homes and they were huge influences. My Mom’s father, poor and Irish, started working to help support his family as a boy after losing his own dad. But the nuns made sure he got an education, and he became a doctor. Even after he passed away, I heard from grateful patients who recalled him kneeling by their bedsides to pray together. His wife, my grandmother, grew up in a Nebraska home where an ice box wasn't something you plugged into the wall but something you lowered into the ground. With 7 children, she never stopped moving - or loving. My Dad’s father made his way through college working on Denver’s trolley cars. He practiced law through the Great Depression. And taught me that lawyers exist to help people with their problems, not the other way around. His wife came from a family of pioneers. She loved to fish. And she taught me how to tie a fly. I want to thank my friends. Liberals and conservatives and independents, from every kind of background and belief, many hundreds have written this committee on my behalf. They have been there for me always. Not least when we recently lost my uncle Jack, a hero of mine and a lifelong Episcopal priest. He gave the benediction when I took my oath as a judge 11 years ago. I confess I was hoping he might offer a similar prayer for me this year. As it is, I know he is smiling. I want to thank my fellow judges across the country. Judging is sometimes a lonely and hard job. But I have seen how these men and women work with courage and collegiality, independence and integrity. Their work helps make the promises of our Constitution and laws real for us all. I want to thank my legal heroes. Justice White, my mentor. A product of the West, he modeled for me judicial courage. He followed the law wherever it took him without fear or favor to anyone. War hero. Rhodes scholar. And, yes, highest paid NFL football player of his day. In Colorado today there is God and John Elway and Peyton Manning. In my childhood it was God and Byron White. I also had the great fortune to clerk for Justice Kennedy. He showed me that judges can disagree without being disagreeable. That everyone who comes to court deserves respect. And that a legal case isn’t just some number or a name but a life story. Justice Scalia was a mentor too. He reminded us that words matter — that the judge’s job is to follow the words that are in the law — not replace them with words that aren’t. His colleagues cherished his great humor too. Now, we didn’t agree about everything...The Justice fished with the enthusiasm of a New Yorker. He thought the harder you slapped the line on the water, somehow the more the fish would love it. Finally, there is Justice Jackson. He wrote clearly so everyone could understand his decisions. He never hid behind legal jargon. And while he was a famously fierce advocate for his clients as a lawyer, he reminded us that, when you become a judge, you fiercely defend only one client — the law. Mr. Chairman, these days we sometimes hear judges cynically described as politicians in robes. Seeking to enforce their own politics rather than striving to apply the law impartially. But I just don’t think that's what a life in the law is about. As a lawyer working for many years in the trial court trenches, I saw judges and juries — while human and imperfect — trying hard every day to decide fairly the cases I presented. As a judge now for more than a decade, I have watched my colleagues spend long days worrying over cases. Sometimes the answers we reach aren’t ones we would personally prefer. Sometimes the answers follow us home and keep us up at night. But the answers we reach are always the ones we believe the law requires. For all its imperfections, the rule of law in this nation truly is a wonder - and it is no wonder that it is the envy of the world. Once in a while, of course, we judges do disagree. But our disagreements are never about politics — only the law’s demands. Let me offer an example. The first case I wrote as a judge to reach the Supreme Court divided 5 to 4. The Court affirmed my judgment with the support of Justices Thomas and Sotomayor — while Justices Stevens and Scalia dissented. Now that’s a lineup some might think unusual. But actually it’s exactly the sort of thing that happens ‑ quietly, day in and day out - in the supreme court and in courts across our country. I wonder if people realize that Justices Thomas and Sotomayor agree about 60% of the time, or that Justices Scalia and Breyer agreed even more often than that. All in the toughest cases in our whole legal system. Here’s another example. Over the last decade, I've participated in over 2,700 appeals. Often these cases are hard too: only about 5% of all federal lawsuits make their way to decision in a court of appeals. I’ve served with judges appointed by President Obama all the way back to President Johnson. And in the Tenth Circuit we hear cases from 6 states — in two time zones — covering 20% of the continental United States. But in the West we listen to one another respectfully, we tolerate and cherish different points of view, and we seek consensus whenever we can. My law clerks tell me that 97% of the 2,700 cases I’ve decided were decided unanimously. And that I have been in the majority 99% of the time. Of course, I make my share of mistakes. As my daughters never tire of reminding me, putting on a robe doesn't make me any smarter. I’ll never forget my first day on the job. Carrying a pile of papers up steps to the bench, I tripped on my robe and everything just about went flying. But troublesome as it can be, the robe does mean something--‑and not just that I can hide coffee stains on my shirt. Putting on a robe reminds us that it’s time to lose our egos and open our minds. It serves, too, as a reminder of the modest station we judges are meant to occupy in a democracy. In other countries, judges wear scarlet, silk, and ermine. Here, we judges buy our own plain black robes. And I can report that the standard choir outfit at the local uniform supply store is a pretty good deal. Ours is a judiciary of honest black polyester. When I put on the robe, I am also reminded that under our Constitution, it is for this body, the people’s representatives, to make new laws. For the executive to ensure those laws are faithfully enforced. And for neutral and independent judges to apply the law in the people’s disputes. If judges were just secret legislators, declaring not what the law is but what they would like it to be, the very idea of a government by the people and for the people would be at risk. And those who came to court would live in fear, never sure exactly what governs them except the judge’s will. As Alexander Hamilton explained, "liberty can have nothing to fear from” judges who apply the law, but liberty "ha[s] every thing to fear" if judges try to legislate too. in public life, he was dignified and firm. and rancor softened by the amenity of his manners. These words stick with me. I keep them on my desk. They serve for me as a daily reminder of the law’s integrity, that a useful life can be led in its service, of the hard work it takes, and an encouragement to good habits when I fail and falter. At the end of it all, I could hope for nothing more than to be described as he was. If confirmed, I pledge that I will do everything in my power to be that man.